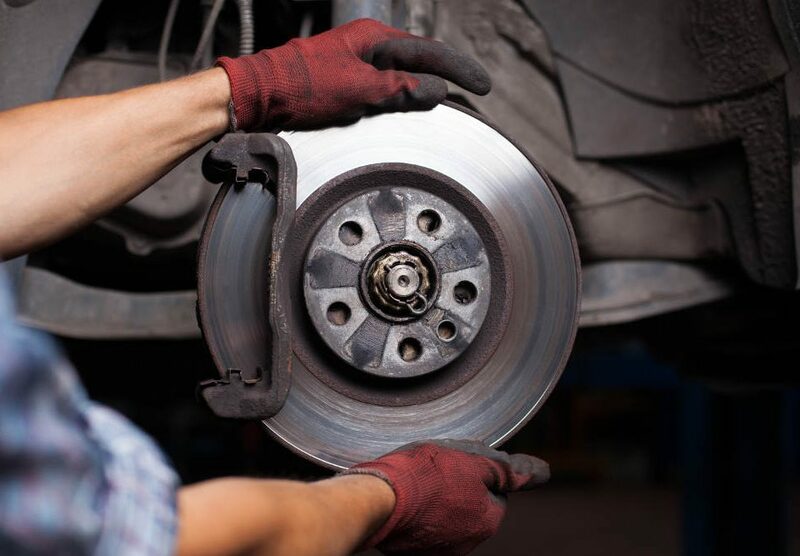 One of the most important tasks that you can do for your vehicle is to properly maintain its brakes. Although our technicians check your brakes every time you bring your car into Road Runner Auto Care for normal servicing, paying attention to what your vehicle does and how it sounds can tell you a lot and tip you off to possible problems that need attention. Generally, brakes need repair every 30,000 miles or so, depending on your driving habits. Look for these telling signs that can signal problems long before the brake light comes on. You should never hear your brakes when you depress the pedal, so when you hear something, bring your vehicle into Road Runner Auto Care for inspection. Common sounds that indicate trouble include high-pitched screeching or squealing or low-pitched growling. Both types of sounds indicate a need to replace brake pads. Grinding occurs when brake discs and calipers rub against each other and can result in damaged rotors. If your vehicle pulls to one side when you brake, several factors can be the culprit, including underinflated tires. However, you may have a more serious problem, such as uneven wear on the brake pads, stuck brake cylinders or even foreign matter in the brake fluid, necessitating a complete drain. This is one of the first signs that drivers notice. When your vehicle takes longer than normal to stop on a dry surface or when you must apply more pressure to the brake pedal, these are signs that your brakes have worn components that should be replaced during servicing at Road Runner Auto Care. Feeling vibrations through the steering wheel while driving is definitely not normal. Vibrations or a pulsing brake pedal signal warped rotors, which occur when you brake hard for a long period when driving down steep slopes. Doing so causes high friction that results in hot rotors, which in turn, causes warping. 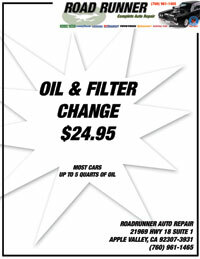 Vibrations, however, can also indicate that your vehicle is out of alignment, so no matter what the cause, it’s still a good idea to have Road Runner Auto Care thoroughly check your vehicle. It’s always better to be on the safe side when something doesn’t feel right with your brakes. Come into our Apple Valley facility anytime to get superior care from our certified technicians.